24/01/13 -- Soycomplex: Mar 13 Soybeans closed at USD14.35 1/4, down 1 3/4 cents; May 13 Soybeans closed at USD14.23 3/4, down 3 cents; Mar 13 Soybean Meal closed at USD414.70, down USD1.80; Mar 13 Soybean Oil closed at 52.11, up 8 points. Funds were said to have been net sellers of around 4,000 soybean contracts on the day. The USDA reported the sale of 510 TMT of US soybeans sold to China and 113 TMT sold to "unknown" both for 2013/14 delivery - there was no confirmation of any old crop sales, yet. That may come in tomorrow's delayed weekly export sales report, trade estimates for which are a robust 700 TMT-1.2 MMT. A slightly wetter outlook for Argentina is what has the trade on the defensive, even though MDA CropCast cut their forecast for soybean production there by 580 TMT from last week to 51.53 MMT (versus 54 MMT from the USDA). They left their Brazilian production estimate unchanged at 82.03 MMT (versus the USDA's 82.5 MMT). Oil World said that "the transition from US to S American soybean supplies could turn out to be more difficult than expected in the next 1-3 months. 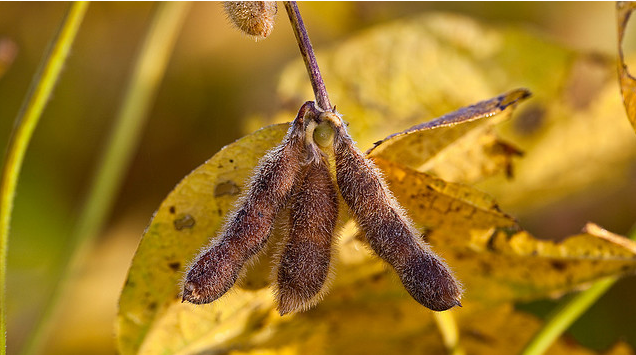 Insufficient South American exports in Feb and March could have an explosive impact on the US soybean futures in the March contract,"they suggested. Corn: Mar 13 Corn closed at USD7.24 1/4, up 3 1/2 cents; May 13 Corn closed at USD7.24 1/4, up 1 1/2 cents. Corn proved to be the strongest leg of the complex, which is interesting given the appalling run of sorry exports since the 2012/13 marketing year began. The USDA are expected to reveal weekly sales of only 150-350 TMT in tomorrow's report. Domestic demand from the ethanol sector isn't great either. The US Energy Dept said that ethanol production increased by just 8,000 barrels/day versus last week's low to 792,000 bpd, which is still well below the level required to hit USDA projections. Ethanol production margins are however said to have improved in recent weeks. MDA CropCast cut their Argentine corn production estimate by 330 TMT from last week to 23.10 MMT, and left their Brazilian estimate unchanged at 71.37 MMT. The USDA's Foreign Agricultural Service estimated Brazil’s corn crop at 72.5 MMT versus the official USDA forecast of 71.0 MMT. "Rains remained active across northern Brazil this past week, which further improved moisture across Mato Grosso, Mato Grosso do Sul, Goias, Minas Gerais, and Bahia. Rains should remain abundant across northern areas this week, and additional improvements in moisture are expected there. These showers will be very beneficial for second crop corn early growth as well as late growth of soybeans," said MDA CropCast. Wheat: Mar 13 CBOT Wheat closed at USD7.68 1/2, down 6 1/4 cents; Mar 13 KCBT Wheat closed at USD8.21 1/2, down 8 3/4 cents; Mar 13 MGEX Wheat closed at USD8.55 1/2, down 5 cents. Wheat prices have faltered this week after posting their biggest weekly gain since July last week. Weekly export sales for wheat tomorrow are expected to be in the 300-550 MT region. Sales of around 435,500 MT are needed to keep pace with the current USDA target. Japan bought 119 TMT of a mixture of US, Australian and Canadian wheat. Taiwan is tendering for 78 TMT of US wheat for Mar/Apr shipment. India is tendering to sell 150 TMT wheat for Feb/Mar shipment to make some room for the impending arrival of what is expected to be another bumper new crop. The USDA's Foreign Agricultural Service estimated Brazil’s 2012/13 wheat crop at 4.3 MMT, a 5-year low, versus the USDA estimate of 4.8MMT and 26% down year-on-year. They will need to import more wheat than normal this year, and cast the net somewhat wider than their regular supplier Argentina who have problems in terms of volume and quality. The FAS estimated Brazil's what imports from the US at 1.5 MMT and those from Canada at 1.0-1.5 MMT. MDA CropCast estimated the world 2013/14 wheat crop at 678.2 MMT. The USDA have production this season at 654.3 MMT, so that would represent a 3.7% increase. 24/01/13 -- EU grains closed lower with Mar 13 London wheat down GBP1.75/tonne to GBP213.00/tonne, May 13 down GBP2.00/tonne at GBP214.00/tonne and new crop Nov 13 falling GBP2.80/tonne to GBP187.00/tonne. Front month Mar 13 Paris milling wheat slumped EUR4.75/tonne to close at EUR246.75/tonne. The pound remained under pressure following David Cameron's pledge to hold a referendum on Britain's EU membership, even if it won't happen for a while yet. Fears for the UK economy following the recent spate of high profile business failures on the High Street, and news that retailer's Christmas sales hardly rose at all did nothing to improve sentiment. Sterling slumped below 1.18 against the euro, and very close to it's lowest level since late 2011, whilst against the dollar it fell to it's worst since August last year. A weak pound should be supportive for UK wheat, but not today, even with no export interest to speak of. The best we can say is that London wheat didn't in the end decline as much as Paris wheat. Customs data out of the leading French export port of Rouen reported grain exports of 114 TMT in the week through to Jan 23, down nearly 29% on the previous week. Wheat exports were down almost 40% to 76,500 MT. Algeria took 30 TMT of that, with a further 27,500 MT going to Morocco and 4,400 MT destined for the UK. The Russian Deputy Minister of Agriculture urged committees thee to "consider the possibility" of reducing import duty on wheat to zero, even though the Deputy PM said that he sees no need to consider such a move. This smacks of similarities with the "will they/won't they" contradictory comments surrounding reports of the possible introduction of export ban earlier in the season. Separately, the Russian Ministry also said that the country's grain intervention stocks currently stand at 3.33 MMT, and to "stabilise demand" they expect to sell "nearly" 3 MMT of those between now and the end of the 2012/13 season. That doesn't leave a lot to play with as far as carryover stocks are concerned. Domestic Russian wheat prices, at or close to record highs, are now amongst the highest in the world. Elsewhere, Agritel said that Ukraine's grain exports will "struggle to reach 1.5 MMT" this month. They exported 2.5 MMT of grains in December and 3.3 MMT in November. What is being shipped out now is almost exclusively corn. Hopes that rain in the forecast for some parts of the extremely dry US Plains have put US wheat under a bit of pressure this past few days. There are however many who are far from convinced how beneficial these will really be. "Drought covers approximately 92% of the central and northern Plains, 55% of the southern Plains and Delta, and 51% of the Midwest. The best improvements this past week occurred across the Delta and south central Midwest," said MDA CropCast. However they see only "some very minor improvement possible in the east central Plains." Adding that "the core drought areas in the west central Plains should see little, if any, relief." MDA CropCast went on to forecast EU winter wheat production at 132.04 MMT in 2013/14, with OSR output at 18.49 MMT and the barley crop here at 52.9 MMT. 24/01/13 -- The overnight grains are extending last night's losses. Latest weather forecasts are apparently putting a bit more rain in the forecast for Argentina. Nevertheless, my chum Gail Martell suggests that a growing La Nina influence may be responsible for the reduced rainfall in Argentina and southern Brazil this month, reversing a pattern of wetness previously in December. "High pressure has dominated southern South America in January, stabilizing the atmosphere and reducing rainfall. 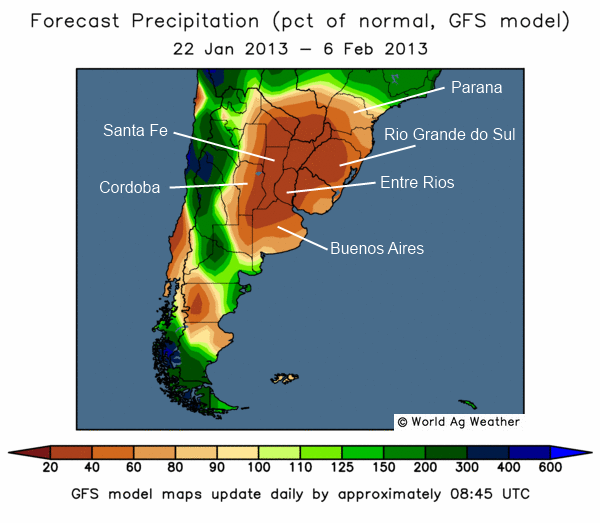 Argentina's top 2 corn provinces Buenos Aires and Cordoba have received less than 40% of normal rainfall. This is especially damaging for shallow-rooted corn and soybeans, planted late and having a shallow root system. Emerging drought, along with a very dry atmosphere, is stressful for young crops," she says. "It is ironic drought stress is possible following spring flooding. 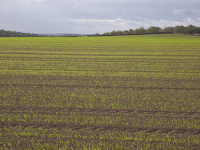 Shallow rooted crops quickly succumb to drought, when the topsoil dries out," adds Gail. "Brazil farm states Parana and Rio Grande do Sul have also experienced hot days, cool nights and low humidity. Soil moisture in southern Brazil is better than Argentina's. Corn and soybeans have a deeper root system, not plagued by persistent flooding that occurred in Argentina. Certainly very low humidity and dryness has been stressful for developing corn and soybeans in January. But conditions are much better than Argentina," she notes. There's already talk of port congestion in Brazil, where heavy rains in northern areas like Matto Grosso have delayed the early harvest causing a back-up of vessels waiting to load soybeans that aren't there. Local analysts Agro Consult are already forecasting loading delays of 45 days come February, I read this morning. This could well see some demand shift to North America. Not too much of a problem for corn, indeed a few extra sales would be welcome, but that would further tighten already "shark's arse at fifty fathoms" tight US soybean availability in the second half of the current season. Switching subjects, there were some wire reports doing the rounds yesterday that current "hotter than a dingo's arse" Australian weather might hurt wheat production there next season. Seeing as planting doesn't even start for another 3 months or so, then it seems a bit premature to be fretting too much over that one just yet. Recent gossip that China may continue to expand it's rapeseed imports (2012 imports were up 132% vs 2011) by lifting a ban on product from Australia caused the recently launched Chinese rapemeal futures to fall their daily limit overnight. No doubt also influenced by last night and this morning's Chicago soymeal activity. Ozzie rapeseed was banned from going into China back in 2009 when they found a fungal disease in some Australian cargoes and the Chinese have subsequently sourced almost all of their import needs from Canada. Cynics would say that it's surprising that the old rules go out of the window when your import needs more than double isn't it? But not me. 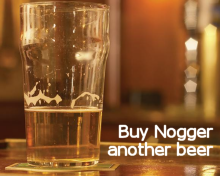 I can say what I like about China as Nogger's Blog is still officially banned over there I gather. They've got no sense of humour have they? Which reminds me, when I was watching the Olympics on the telly with MrsN#3 last summer she said: "Wow, these Chinese are brilliant at everything. I bet you can't name one thing that they're not good at." I said "I bet I can: cockle picking!" 23/01/13 -- Soycomplex: Mar 13 Soybeans closed at USD14.37, down 14 3/4 cents; May 13 Soybeans closed at USD14.26 3/4, down 12 1/2 cents; Mar 13 Soybean Meal closed at USD416.50, down USD5.10; Mar 13 Soybean Oil closed at 52.03, down 40 points. The soycomplex gave up most of yesterday's gains in a holiday delayed "turnaround Tuesday" style. Funds were estimated to have sold 5,000 of the 6,000 soybean lots they bought yesterday in a swift change of heart. Exactly why that should be is difficult to quantify, South American weather forecasts don't look much different today than they were yesterday. We've still got below normal rainfall for Argentina and southern Brazil and above normal for northern Brazil. Agro Consult estimated Brazil’s soybean crop at 84.0 MMT, unchanged from previous estimate although 1.5 MMT more than the USDA. Celeres said that as of Jan 21st the Brazilian soybean harvest was 2% complete. There's trade rumour that China is looking for beans for Feb/Mar shipment. The gossip suggests that they may be looking to the US to supply their requirements as there's already talk of port congestion in Brazil. The normal USDA weekly export sales report is delayed to Friday due to the MLK Day holiday on Monday. Soybean sales and shipments could well exceed 1 MMT again. Corn: Mar 13 Corn closed at USD7.20 3/4, down 7 3/4 cents; May 13 Corn closed at USD7.22 3/4, down 7 1/2 cents. Fund net selling in corn was estimated at 7,000 lots on the day. Agro Consult estimated Brazil’s 2012/13 corn crop at 74.7 MMT, unchanged from previous estimate and 3.7 MMT more than the USDA's 71 MMT forecast. The weekly US ethanol production report comes out tomorrow, last week's output at 784,000 barrels per day was the lowest weekly total since they starting issuing data in mid-2010. Ethanol margins are very poor at the moment and more plants are being mothballed because of it, reducing demand for corn from that sector. US exports are also very slow, highlighted yet again by another poor export inspections number released on Tuesday. Last week's weekly export sales of 393,300 MT just about managed to beat the level required to hit the USDA's recently reduced export target for the season of 26 MMT. That was the first time that has happened in eight weeks. Trade estimates for this week's one day delayed export sales report will be released tomorrow, expect these to be in the 250-450 TMT range. Wheat: Mar 13 CBOT Wheat closed at USD7.74 3/4, down 4 1/2 cents; Mar 13 KCBT Wheat closed at USD8.30 1/4, down 1/2 cent; Mar 13 MGEX Wheat closed at USD8.60 1/2, down 3 3/4 cents. Fund selling in Chicago wheat was estimated at around 2,000 contracts on the day. Wheat followed corn and soybeans lower, forecasts for some moisture relief on the parched Southern Plains added a bit of pressure. "Drought stressed winter wheat areas in the Great Plains also are expecting variable precipitation in the new forecast. Farms in northern Oklahoma and south-central Kansas stand to get 0.50 to 1 inch of rainfall. These are the driest areas of the bread-basket. Less than 40% of normal rainfall has occurred over the past 90 days. Other areas of the wheat belt may miss out. Little if any precipitation is projected for the Texas panhandle and southwest Kansas," say Martell Crop Projections. The Kazakhstan Ag Ministry estimated their 2012/13 grain exports at 7.0 MMT versus a previous estimate of 8.0 MMT and down 42% on 12.1 MMT last season. There's continued talk of Russia waiving wheat import duties, although their PM has denied that this will happen. 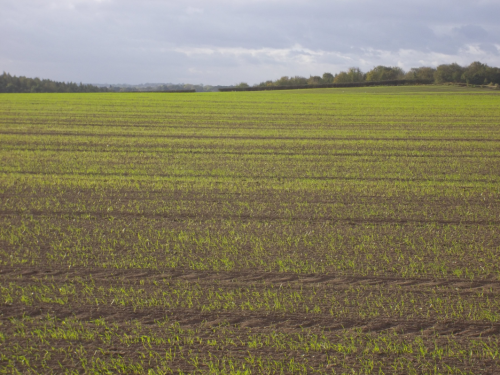 23/01/13 -- EU wheat futures closed mostly lower with benchmark May 13 unchanged at GBP216.00/tonne and new crop Nov 13 down GBP1.20/tonne at GBP189.80/tonne. Mar 13 Paris wheat was EUR1.50/tonne lower at EUR251.50/tonne. January London wheat went off the board today GBP0.75/tonne weaker at GBP212.75/tonne. Both London and Paris wheat traded both sides, but ultimately closed generally lower pressured by a weak showing from Chicago wheat on the back of calls for some chance of moisture relief in the week ahead for parts of the parched Great Plains. Given the very poor state of US winter wheat in many parts however, it seems unlikely that the forecast "up to a half-inch of precipitation in parts of eastern Kansas" will be drought resolving. Looking further ahead, in their 31-60 day outlook MDA CropCast say "The precipitation outlook has trended drier across the northeastern Plains, northwestern Midwest, Delta, and Southeast, and wetter in the southwestern Plains. 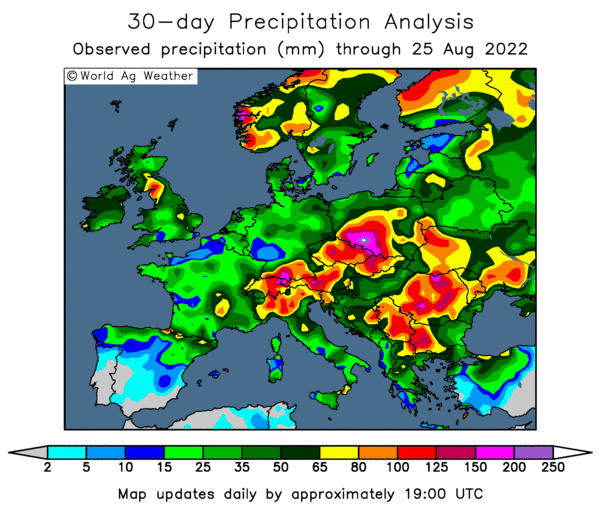 The wetter pattern across the southwestern Plains would improve moisture there a bit for wheat, while dryness would continue in the north central and eastern Plains." Premium wheat availability is tightening, with the Black Sea hanging up the "sold out" signs. EU exports are running well ahead of last year, and Argentina has taken a major hit both in terms of quality and quantity this year. Cash prices for Australian premium prime wheat meanwhile are said to be commanding significantly larger premiums than normal at around 65 cents over Chicago wheat levels, compared to 40-60 cents under for much of last year. That takes FOB offers to around USD360/tonne for February shipment. India has plenty of wheat to sell, but they aren't everyone's cup of tea given their limited Western-standard storage capacity. India's State Trading Corp. reportedly got a best bid of USD314.34/tonne FOB today in a tender to export 40 TMT of wheat from Chennai port in February. That's around USD20-30/tonne cheaper than US or French wheat offers currently in the market. Chinese customs data shows that they imported 3.689 MMT of wheat in 2012 - the highest volume since 2004 - and up 195% from a year ago. Disease and adverse weather conditions are said to have sapped the quality of last year's domestic wheat crop. 23/01/13 -- After a completely manic start to 2013, there actually seems to be a bit of light at the end of the tunnel! Most of the various website projects on the go are finally just about complete and ready to launch I'm pleased to say. I may even have a bit more time on my hands to do a bit more blogging too for you, my dear deprived reader. Yesterday's heat in the market seems to have evaporated rather quickly, with the overnight grains generally only showing very modest gains. I personally can't help thinking that the dryness concerns in South America are being over-hyped a little. It was, after all, not that long ago that Argentina was awash with flood water. Time will tell. What is probably being under-hyped though are the rapidly decreasing US soybean stocks, which the market seems strangely quite relaxed about. Exactly how is this record Brazilian crop going to get where it needs to go in an efficient amd timely manner once the harvest is underway in earnest? (Where's Earnest, I hear you wonder). And who is going to be able to step in and fill the void when there's a 2-3 month wait to get loaded in Brazil and the Argentine dockers/farmers/truckers are on strike again with America sold out? Oil World have estimated Argentina’s new soybean crop at 52.0 MMT, down 1 MMT from their previous estimate. They've increased Brazil from 81.0 MMT to 81.5 MMT. China's ongoing demand for oilseeds may see them lift a ban on Australian canola imports that's been in place for the last three years within the next few months, report Reuters. China imported 2.93 MMT of rapeseed in 2012, up 132.1% on the previous year. China's 2012 soybean imports meanwhile were 58.38 MMT, up 10.9% vs 2011. Imports from the US were 25.97 MMT, up 16.62%. Imports from Brazil came in at 23.89 MMT up 15.85%, whilst those from Argentina dropped 24.23% to 5.896 MMT. Even China's not keen on the Argies it would appear, and who can blame them? China also imported a record 5.207 MMT of corn in 2012, and upped wheat imports by 195% to 3.689 MMT - the highest since 2004. Soybean oil imports meanwhile were up 59% to 1.826 MMT and palm oil imports rose 7% to 6.34 MMT. Have you spotted the trend yet? Didier Drogba imports were also sharply higher. The Kazakh Ministry say that their 2013 wheat area will decline 2% on last year to 13.1 million hectares, although prospects for production this year are said to be favourable once the plentiful snow cover melts. Russia sold 62,681 MT of wheat from it's intervention stocks last week, making the total sold since sales began to 1.384 MMT. Michael Cordonnier estimated the 2013 US corn area at 98.5 million acres versus Informa's 99.3 million forecast of last week and 1.6 million up on last year. For soybeans he goes for 78.7 million, versus Informa's 78.8 million and 77.2 million in 2012. He pegs this year's US corn yield at 153 bpa and soybeans at 43.0 bpa versus 123.4 bpa and 39.6 bpa respectively in 2012. He estimated the Brazilian soybean crop at 81.0 MMT, with output in Argentina at 53.0 MMT. Corn production was forecast at 70.0 MMT and 22.5 MMT respectively. All estimates are unchanged from last week. The Argie corn number remains well below that of the USDA (28 MMT). 22/01/13 -- Soycomplex: Mar 13 Soybeans closed at USD14.51 3/4, up 22 1/2 cents; May 13 Soybeans closed at USD14.39 1/4, up 22 1/2 cents; Mar 13 Soybean Meal closed at USD421.60, up USD7.20; Mar 13 Soybean Oil closed at 52.43, up 75 points. 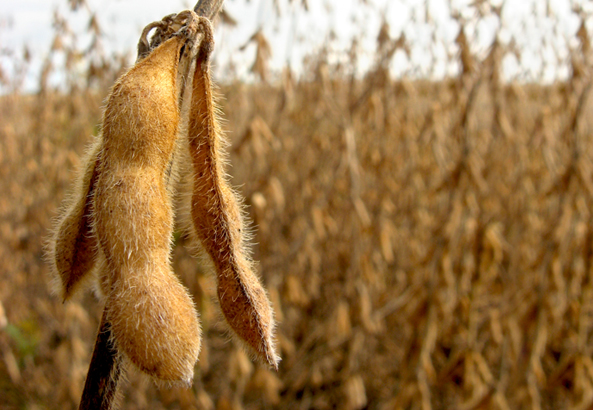 Funds were said to have been net buyers of around 6,000 soybean contracts on the day, pushing prices to a 5-week high. Dryness concerns in southern Brazil and Argentina are what is getting the market a little excited. Meanwhile northern Brazil is wet, delaying early harvest attempts there. There's talk of fresh old crop soybean sales to China, but no confirmation. The USDA did today however announce the sale of 120 TMT of new crop optional origin beans to China. There's also gosspip that delays to the early harvest in Matto Grosso has China in the market shopping for soybeans for near immediate shipment. A possible sign of things to come that one. Weekly export inspections underlined the very strong demand for nearby beans coming in at 48.075 million bushels versus the expected 34-44 million. It looks like we are in for another bullish weekly export sales report on Friday, following on from last week's marketing year high total of 1.6 MMT of old crop, plus a further 118 TMT of new crop. Corn: Mar 13 Corn closed at USD7.28 1/2, up 1 cent; May 13 Corn closed at USD7.30 1/4, up 1 cent. The dryness issue in parts of South America was supportive. Spillover weakness from wheat was not. Weekly export inspections of 10.959 million bushels were in line with the expected 7-15 million, but still pretty poor nevertheless. They need to average 20.8 million/week to meet the 950 million bushels of exports projected by the USDA. Safras e Mercado estimated Brazil’s corn crop at 70.7 MMT versus their previous estimate of 69.0 MMT and 72.7 MMT in 2011/12. UAE bought 20 TMT of South American corn, with Kuwait taking 40 TMT of the same. The recent Japanese trend towards using less corn in feed rations continues, with Nov usage slipping to 42.5% versus 45.1% in Nov 2011. The US share of that market has also slipped sharply, from 91% to 78% in the first eleven months of 2012. Ukraine has exported seven times more corn than wheat so far this month (980 TMT vs 140 TMT), with corn now responsible for almost half of their total grain exports (47%). That figure is likely to be around 60% by the end of the season. Wheat: Mar 13 CBOT Wheat closed at USD7.79 1/4, down 12 cents; Mar 13 KCBT Wheat closed at USD8.30 3/4, down 13 cents; Mar 13 MGEX Wheat closed at USD8.64 1/4, down 9 3/4 cents. Early strength in the overnight market soon gave way once they daytime session opened, although it's hard to put a reason as to why this was the case. India said that it wants to export more wheat ahead of what it says will be another record crop, the harvesting of which is now only a couple of months away. Bangladesh bought 50 TMT of optional origin wheat (probably Indian) for Feb/March shipment. South Korea bought 60 TMT of South American/Indian wheat for shipment in May. UAE bought 20 TMT of Australian hard wheat. US wheat is competitive versus EU origin, but there are clearly still other better offers out there depending on where the buyers are. Weekly export inspections of 21.857 million bushels were better than the expected 13-19 million, but below the 25.2 million needed each week to reach the current USDA export estimate. Japan are in for 119 TMT of US/Canadian and Australian wheat in their regular weekly tender to be concluded on Thursday. Continuing dryness on the US Plains remains a worry for the 2013 winter wheat harvest. 22/01/13 -- EU grains were mixed but mostly lower with May 13 down GBP1.65/tonne to GBP216.00/tonne and new crop Nov 13 up GBP0.25/tonne to GBP191.00/tonne. Mar 13 Paris milling wheat was EUR1.50/tonne firmer to close at EUR253.00/tonne. EU wheat was higher for much of the day, but moved lower in late afternoon trade as Chicago wheat turned negative soon after trade in the open outcry daytime session began. Bangladesh bought 50 TMT of optional origin wheat for Feb/Mar shipment, South Korea have booked 60 TMT of South American/Indian feed wheat in a tender. The former may also end up being of Indian origin. India are said to have sold 2.3 MMT of wheat (and shipped 1.5 MMT of it) against a government target to release 4.5 MMT of it's state-owned stocks before their new crop gets harvested in March/April. There are some reports today that they'd like to increase this target by another 5 MMT to 9.5 MMT, although exactly how they are going to manage that in such a tight timeframe given their limited logistics is far from clear. Confidence is high however that India will at least match last year's record wheat crop, and possibly beat it. The plight of the US winter wheat crop has recently been grabbing the market's attention, although it had been know for some time that conditions are very poor on the Plains. The USDA stopped issuing weekly reports at the end of November. Individual state offices will release their own estimates later this month, with poor/very poor ratings in major producing states like Kansas and Oklahoma expected to have increased. 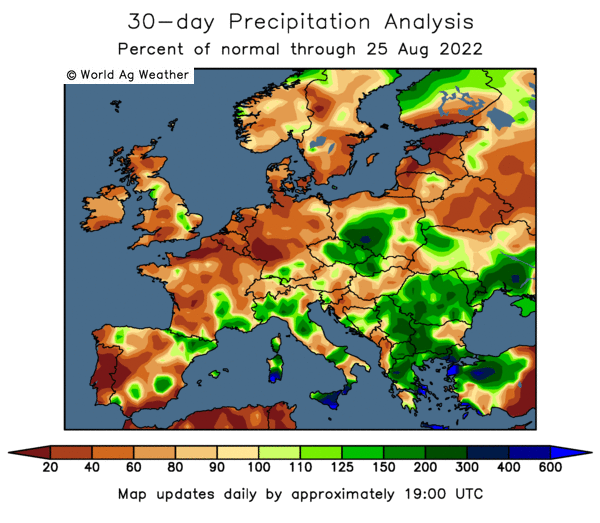 Dryness concerns in southern Brazil and Argentina are also being voiced, although it seems too early yet to be forecasting serious yield reductions for corn and soybeans. Ukraine has exported 1.28 MMT of grains so far this month (to Jan 21) and is expected to finish the month shipping around 1.45-1.50 MMT, according to the local Farm Confederation. That contrasts with the 2.5 MMT exported in December and the 3.3 MMT shipped out in November as availability dries up. This month's total so far includes 0.98 MMT of corn (76.5% of the total volume shipped) and 0.14 MMT of wheat (11%), which highlights the recent switch away from wheat. The Ukraine Ministry say that the country has exported 15.5 MMT of grains to date this season, up 46% on the same period in 2011/12, although sales were slow to get going last season due to export tariffs still being in place in Q1. The total volume shipped so far includes 5.96 MMT of wheat, 7.32 MMT of corn and 1.96 MMT of barley. That's very close to the Ministry's "informal" wheat limit with grain exporters of 6 MMT this season. Russia's grain exports this season currently stand at 13.7 MMT, including 9.85 MMT of wheat. The latter closely matches the USDA's projected total for the whole of the season, effectively ruling Russia out of the international market until the summer. 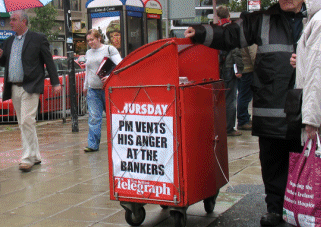 What's Got The Market Excited This Morning? 22/01/13 -- Dryness in South America, that's what. Specifically southern Brazil and much of Argentina. 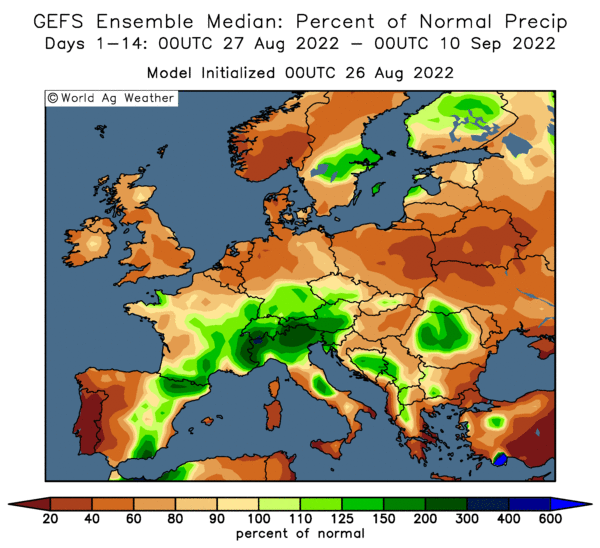 There's very little rain in the forecast for the next fortnight too as the map courtesy of World Ag Weather shows (click to enlarge - don't be shy). Cordoba, Buenos Aires and Santa Fe typically produce around 80% of Argentina's soybeans and corn. Entre Rios is the fourth top producing state for both, according to the USDA. There's precious little precipitation in the forecast for any of these over the next couple of weeks as you can see. Ditto across the border in neighbouring Brazil where the dry spell ahead stretches into southern states of Rio Grande do Sul and Parana. Parana is Brazil's second largest soybean state and ranks top amongst the countries first crop corn producers. RGdS meanwhile is Brazil's third biggest soybean and first crop corn state. Here, soybeans are entering the flowering stage and need decent rain over the next couple of weeks to maximise production. They didn't get it last year and output dropped by half on many farms, whilst growers further north where soybeans mature earlier enjoyed strong yields. Whilst all this is going on, US soybean exports are pouring out at an unprecedented rate and look likely to overshoot the USDA's current forecast for the 2012/13 season (with 89% of that target on the books already). In addition the US crush is 10% up on last year versus the USDA's prediction of a 5.75% drop. So it looks like the USDA are under-estimating both exports and domestic demand, and even with those numbers they still only peg 2012/13 ending stocks at 2 1/2 weeks worth of demand. Yikes! It's no wonder that the market is so sensitive any kind of potential South American production problem. And that's before we start thinking about the inevitable supply disruptions from South America due to logistics. Meanwhile China are said to have sold almost 4 MMT of their state-owned soybean reserve stocks in 2012 in an attempt to contain rising prices. They're gonna need replacing at some point too. Let's hope that they give Brazil/Argentina PLENTY of notice. 21/01/13 -- EU grains closed firmer with Jan 13 London wheat up GBP2.65/tonne to GBP214.25/tonne, May 13 up GBP2.65/tonne at GBP217.65/tonne and new crop Nov 13 GBP2.20/tonne firmer to GBP190.75/tonne. Front month Mar 13 Paris milling wheat rose EUR3.50/tonne to close at EUR251.50/tonne. 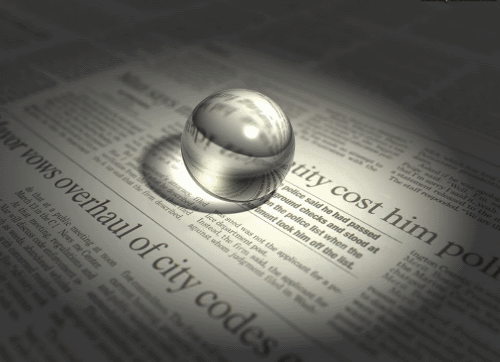 With the US market closed for the Martin Luther King holiday, unlike the snow, fresh news was relatively thin on the ground. Nevertheless wheat began the week on the offensive, buoyed by continued concerns over the prospects for US winter wheat production. US wheat went into winter dormancy in the worst condition on record, and things have got progressively worse since then. Weather maps show drier to much drier than normal conditions over the last 90-days across major wheat producing areas in Kansas and Oklahoma. The 14-day forecast continues to show little in the way of moisture relief for these areas. Russia's grain exports are down 27% year-on-year, to 13.2 MMT as of Jan 9th, according to the Ministry. Even so, domestic Russian wheat prices continue to rise to fresh all-time highs following last year's drought. It is now said to be cheaper to import French wheat to St Petersburg than transport what little grain traders have left for sale in from the Russian interior. There's some trade chatter that Russia may take the unusual step of cancelling import taxes on wheat as a precursor to allowing such a measure, although it would seem that an under the counter deal with Kazakhstan is more likely. Kazakhstan's domestic grain stocks are also falling though, after drought cut their 2012 harvest by more than half. The FAO estimate that will cut their 2012/13 exports by 36% to around 7.3 MMT. 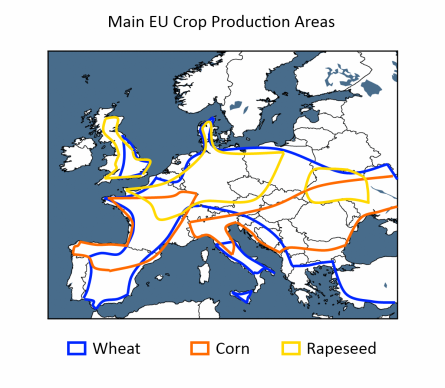 Tunisia are tendering for 50 TMT of milling wheat and 75 TMT of durum wheat, both of optional origin, although Europe is likely to be the most likely source. With EU-27 exports already running 35% ahead of last year's levels, and rising at a rapid rate, more foreign sales are not what is needed. Just as Russia may now be ruing being so aggressive with it's sales campaign in the first half of the season, will Europe find itself regretting doing likewise in the second half? 18/01/13 -- Soycomplex: Mar 13 Soybeans closed at USD14.29 1/4, down 1 cent; May 13 Soybeans closed at USD14.16 3/4, up 2 cents; Mar 13 Soybean Meal closed at USD414.40, up USD0.40; Mar 13 Soybean Oil closed at 51.68, up 19 points. For the week Mar 13 soybeans were up 56 cents (4%), with Mar 13 meal rising almost USD10 (2.4%) and Mar 13 oil up over 250 points (5%). New crop gained on old crop as Informa Economics cut their forecast for US soybean plantings this spring from 79.0 million acres to 78.8 million. Even so that's still an increase of 2% on last year's 77.2 million. 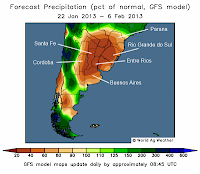 A drier outlook for southern Brazil and central and western parts of Argentina seems to be causing some mild concern. "Moisture shortages are increasing across central and western areas (of Argentina), and the continued drier pattern there through the next week will allow dryness to build further. This will begin to increase stress on corn and soybean growth, especially across northwestern Buenos Aires, Cordoba, southwestern Santa Fe, and La Pampa," said MDA CropCast. Corn: Mar 13 Corn closed at USD7.27 1/2, up 3 cents; May 13 Corn closed at USD7.29 1/4, up 4 cents. For the week Mar 13 corn was 18 3/4 cents firmer (+2.65%) and May 13 up 22 1/4 cents (+3.15%). Spillover support came from wheat rising on dryness concerns amongst the US winter crop. Dryness in parts of Argentina is also raising a few eyebrows, where planting of corn still isn't complete (estimated at 93% done by the Ministry). The final acreage there is expected to be 12% down on last year. Informa Economics estimated US corn plantings for the 2013 harvest at 99.3 million acres, up 0.3 million from their previous forecast. If correct this represents an increase of 2.4 million acres on the 2012 planted area, and that was the largest acreage in 75 years. If US yields recovered from their 2012 disaster and bounced back close to a trendline 160.5 bu/acre, the figure Informa are said to be pencilling in for now, then production this year would jump more than a third to 14.757 billion bushels allowing normal levels of abandonment. With the great US drought of 2012 far from resolved this winter though, that is still a very a big IF at the moment. Wheat: Mar 13 CBOT Wheat closed at USD7.91 1/4, up 10 cents; Mar 13 KCBT Wheat closed at USD8.43 3/4, up 6 3/4 cents; Mar 13 MGEX Wheat closed at USD8.74, up 4 3/4 cents. For the week Mar 13 Chicago wheat gained 36 1/2 cents (4.8%), it's biggest weekly gain since July. 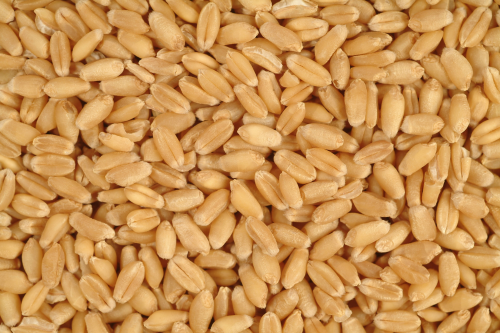 Mar 13 Kansas wheat rose 36 3/4 cents and Mar 13 Minneapolis added 28 3/4 cents. It seems that the large spec short in Chicago wheat hasn't been willing to add to that position this week, and instead has been more prepared to cover in some of those shorts after prices fell to near 7-month lows last week. Informa pegged the US winter wheat acreage at 41.8 million acres from 42.2 million last month and 42.5 million the month before. The Argentine Ministry said that wheat harvesting there is complete and that the final crop total is 9.8 MMT. That's 1.2 MMT less than the USDA's current forecast and represents a drop of almost 37% on last year. Much of the Midwest as well as the central and southern Plains has only very limited snow cover, say MDA CropCast. Temperatures are "expected to turn very cold across the Midwest early next week...the coldest day is currently expected to be Tuesday morning," they add.